Well, June was a very quiet month here on The Indigo Hours, and I haven't got off to much better of a start in July, have I?! I'm already a day late with this post, ha! July is my last month in my current job, having been there almost a year now - my contract finishes at the end of the month anyway, and I'm starting my doctorate course at the beginning of September... So I have a feeling July could be quite a busy month, with trying to get all the loose ends tied off. • Read at least one book. I need to finish at least one book in July to keep on track with my goal of 12 books this year - I've not even got one on the go at the moment so I need to have a little look at my To Be Read heap and choose a good one! • Complete this Blogilates 30-Day Waist Trainer Challenge. I really enjoyed doing the Blogilates 30-Day Abs Challenge last month and wanted to complete another one in July; this one promises to help you gain a stronger, slimmer waist, which I am all for - I've definitely seen results from the Abs challenge, so I'm excited to see what this one can do for me. Again, I'm expecting it to be quite hard work, but hopefully I'll manage to complete the 30 days! • See friends at least twice. Standard monthly goal but I need to include it so that I actually make the effort to see my friends, rather than just coming home from work every evening and hiding in my bed like the antisocial individual that I am. • Complete at least one open water swim. 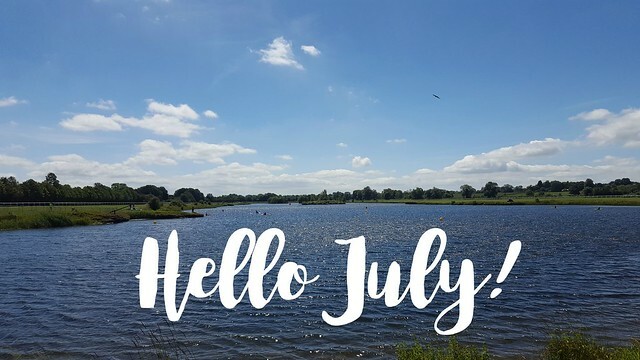 I did my first open water swim in about three years last month and loved it, so I'm determined to fit in as many as I can this summer - I have a wetsuit sat gathering dust so I really need to make the effort to take it out more and get a few swims in whilst the weather is good. • Curb my sweet tooth. I've discovered that "cutting back" on sweet stuff doesn't work for me - I can't do moderation, I find it so much easier to just know that I can't have something. I've just booked a holiday for August so I'd like to lose a little bit of the flab I'm carrying round my middle by then - and hopefully, this paired with the Blogilates challenge will see me right! We're going for a week in Vienna so it won't be a bikini kind of holiday but even so, it's good to have a date to work for and a nice reward for working hard. I don't think I've got anything majorly exciting planned for July just yet - all that springs to mind is a trip to the dentist - thrilling I know! Have you got anything nice planned this month? Are you setting yourself any goals?